We developed this floating knife for the offshore and fishing industries. Where a floating knife is of high importance, it's features also make this knife a perfect tool for water sports enthusiasts. The Mora Floating Serrated Knife is a fixed blade knife that actually floats, thanks to the cork handle. The serrated stainless steel blade is designed for cutting rope, fibers, and nylon. We developed this floating knife for the offshore and fishing industries. Where a floating knife is of high importance, it&apos;s features also make this knife a perfect tool for water sports enthusiasts. The Mora Floating Serrated Knife is a fixed blade knife that actually floats, thanks to the cork handle. The serrated stainless steel blade is designed for cutting rope, fibers, and nylon. The core is made from high-visibility orange polymer making it east to locate if lost in the water. 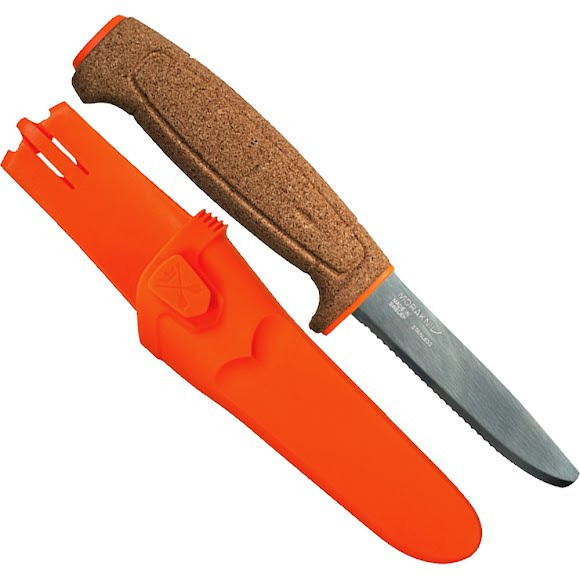 Its light weight makes this knife perfect for a backpack or emergency kit. The smart button allows for a quick connection with other knifes in our craft knife collection, giving you the opportunity to to carry your preferred combination of knifes. The tip is rounded to keep you and your boat safe from injuries.